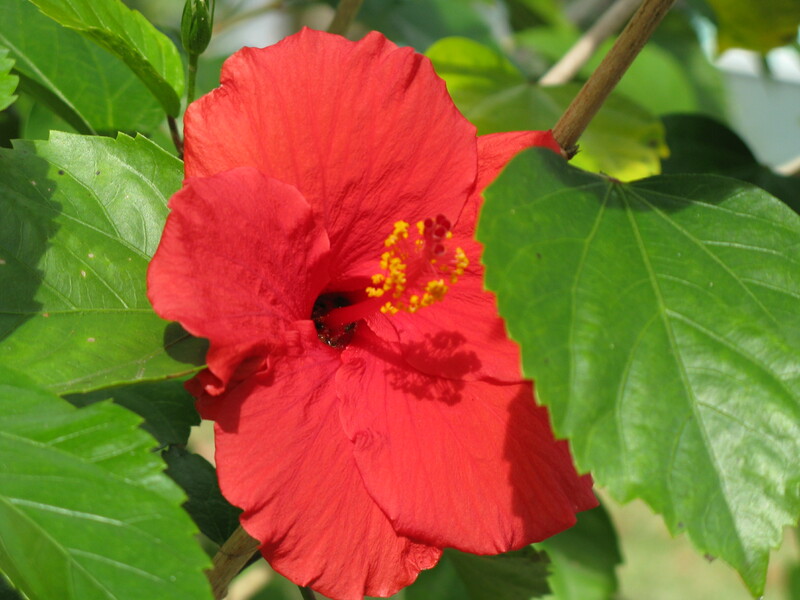 Red Hibiscus - We still have this plant!! 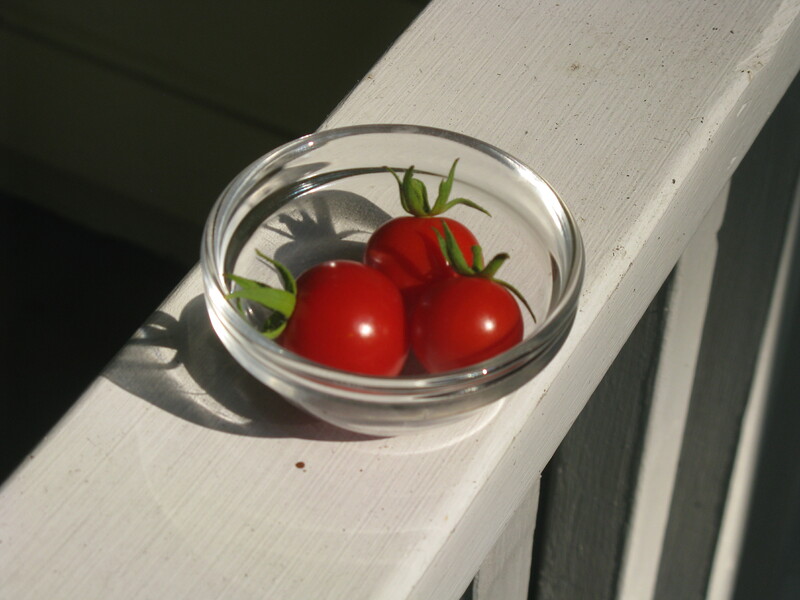 While living in apartments, I was successful growing cherry tomatoes in an outdoor container (we had a south-facing, full-sun front door). That same location was also great for hibiscus as long as I kept the plant adequately fertilized. I have, however, missed having a full vegetable garden. So when we bought our first house 10 years ago, I couldn’t wait to plan and plant our first full-size vegetable garden. But first, we had to deal with the trees. I call them ‘balls-on-a-stick’ pine trees because they are tall pine trees with hardly any branches until the top. Then they form kind of a ball of branches and needles. It really does look like a ball on a stick. And the needles? They are LONG, at least 12-16 inches in length! We spent months getting rid of the three-foot deep side yard of pine needles when we moved in. The trees, themselves, were dangerous in many ways. A lot of them were very close to the house. In fact, you could step on either our front or back porch and casually reach out and touch the trees. Their pine cones, when green and dense, would come plummeting down from above, and my son and I almost got hit a few times while walking in our yard. Also, during any sort of windy storm, parts of dead branches would literally spear themselves into our roof. After a few patches, my husband was getting tired of repairing our roof and I worried about even larger branches crashing right through it. One day, during a particularly active thunder and lightning storm, a HUGE lightning strike zapped the tallest pine tree in our yard. The tree removers guesstimated it was about 130 feet tall, almost too tall for them to remove. That strike scored a winding trail down that tree and I waited with bated breath to hear and feel the crash of the entire tree (or a very large branch) smash onto our house. We were lucky, nothing fell but that strike took out our a/c, fried the motor on our dishwasher and my computer modem, fried the two phone chargers…everything but the fax machine (go figure!). When we took a look around the yard, we noticed scars of previous lightning strikes on a number of the trees and it was decided: the trees had to go. We spent thousands of dollars removing 29 trees and felt much safer both indoors and out. I was thrilled with finally getting some sun in our yard for my garden when we discovered roots! Oh, the roots in our yard!! They were everywhere and ran barely one-to-two inches below the soil and deeper. Ok, let’s face it, it’s not soil here in Florida, it’s sand. Every time we tried to dig, we were jolted to a stop by a root. Some were only 1/2-inch in diameter but others were up to five-to-six inches in diameter! We also discovered the soil was in very poor condition due to the acidity of the pine needles. I had to reconsider growing a traditional vegetable bed. I decided on raised beds and some container gardening but then the recession hit and the vegetable garden had to wait. However, I wasn’t giving up altogether. I designed simple window boxes for flowers. Beautiful flowers! It was a family project. I explained the design to my husband, he built them and secured them to the house, our son painted them and helped me staple in the liners. I filled them with soil, then planted and watered the flowers...and Voila! Poor plants. 😦 I really do need to yank these things out of there. Copyright 2011 – All rights reserved.